The place named Murum is situated in modern Osmanabaad district of Maharashtra state. The place is being a town situated about 86 Kilometers from Osmanabaad district headquarter in South East direction, 77 Kilometers from Solapur district headquarter in East ward direction and about 22 Kilometeres from Omerga town in South West direction. Jain temple of Murum :- Jain temple of Murum is situated in the middle of the town and some narrow roads and passages lead us to this Jain temple. 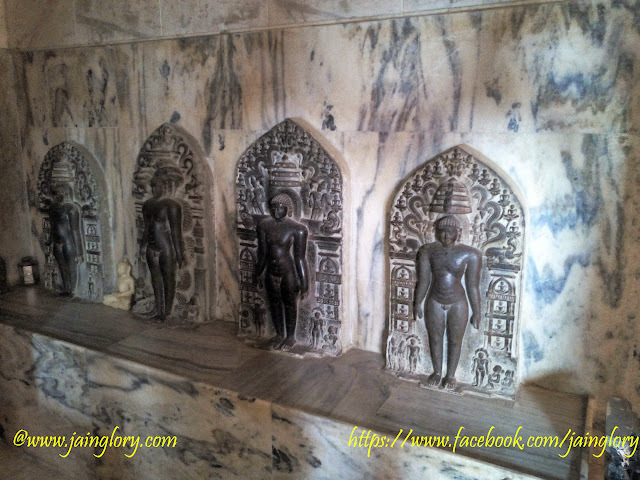 Although The Jain temple is a new structure but it contains some great sculptures of Chalukya era which attest a stronghold of Jainism in this area during 10-12 century AD. Entrance of the temple leads us to a porch which contains an ancient sculpture of Goddess Padmawati. Inner temple or gabhgriha contains a single vedi on which Lord Parshwanatha sculpted in Black marble is installed along with other saviors sculpted in white marble. These white stone sculptures are hailed from later medieval period and depicted in Padmasana posture. Ancient Images of Jinas and Yakshi :- On the vedis adherent to the walls of grabhgriha ; Ancient images of Jina saviors and Yakshinis are installed. On the left side of main vedi 4 images of Jinas are installed. Three images of them are in kayotsarga posture and one in padmasana posture. Two of them are Jina savior Parshwanatha which are depicted with serpent hoods on their head. All the images are masterpieces of Chalukya art and perhaps hailed from 11th century AD. In the parikrama there are two images of Yakshinis installed. These are identified as Yakshi Ambika and Chakreshwari .Image of Yakshi Chakreshwari is depicted in Lalitasana with four arms. This sculpture is independent of Jina sculpture means the image does not carries any Jina image. Depiction of independent Yakshi images in Chalukya era corroborates the popularity of Yakshi cult in Jainism. On the right side of Yakshi Chakreshwari an image of Yakshi Ambika is depicted in Lalitasana with two arms. Mango bud is depicted in her right arm where child is standing beside Yakshini. Two devotees are depicted on her left side praying to her. Above the head of Yakshini an image of Lord Jina is depicted which is obvious in case of Jain art. On the right of main vedi we can see four ancient Chalukyan era images of Jina. Three of them are chaubisi Jina sculptures which contain a principal Jina in the middle and surrounding 23 images on the same panel. Along with these three chaubisis there is an image of Lord Parshwanatha which is comparatively bigger one. The image is also a masterpiece of Chalukya era. All the images which is anciently carved are of height between 2 to 3 feet. Murum was anciently known as Moramb or Morambpur; the fact is well corroborated by ancient paleographical and Inscriptional clues. History of this town leads us to Chalukyan era when Chalukyas of Kalyani were sovereigns of this ancient town. They rendered not only some greatest Jinalayas but also some greatest sculptures of Jina saviors and subordinate deities. Ancient capital of Chalukyans known as Kalyani(BasavKalyan)is not much far from here and Chalukya relics and vestiges unearth in this area. The Jain temple is also mentioned by Prabhakar deo in his book “Temples of Marathawada”. According to him there were number of Jain temples in the town and temples were endowed by Chalukyan monarchs and feudatories. The fact is well attested by Inscriptional evidences.